I have just completed a search and agreed a deal on a fantastic property for some lovely clients. They could not be happier and neither could I – when everything clicks with a search and the people and property fit like a glove, it is an immensely satisfying feeling. I had a strong inkling during this search – as I always do – which property would really work for these clients but of course, buying a home is a very personal and emotive experience so it is never possible to make exact predictions nor do I want to influence my clients other than in a professional capacity. However, this is a couple who have really planned this move down to the last detail and know exactly what they want to achieve and how they are going to do it and they definitely have the energy and vision to see it through so it is very exciting to be part of this; another step on the way to their new life. My main motivation for setting up this property finding business was to help people aquire the best possible property for them, while ensuring they avoid the pitfalls and the stress so that the whole process becomes a pleasure. What a great feeling; knowing you have helped someone’s dream come true. I would not normally consider writing on a blog site however, this is an exceptional circumstance in that without Nadia’s combination of a love of the area, total dedication to her clients and absolute proffessionalism, i would not now have a little piece of paradise that one day i will call home. 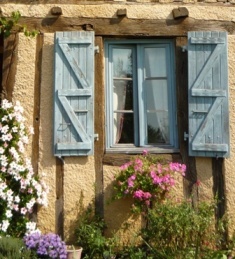 My journey started many months ago with a very tall and difficult order of finding the perfect property to begin a long planned life in France. Nadia above all other agents requested information not only about the style and size of the property but basic information about the individuals she would spend many hours searching for. I realise that her insight of human nature is such a unique skill that means so much more when searching that most agents do not even consider. Every property she looked at for me was followed with a detaied report listing not only the good but the bad and those little things we as enthusiastic house buyers often forget in our haste. I know i am a very difficult person to please at the best of times and as a Brit’ living in the Middle East only made that so much more of a task. Nadia rose to that challange with her own unique style and shortlisted properties that perfectly fitted the criteria and were exactly as described, there were no hidden surprises. The lady has a blend of honesty, humour and negotiating skills that place her in the perfect job. She is the ultimate ‘house hunter’ anyone considering a house in her area’s should without reservation employ her skills to find that perfect French home from the start to the absolute finish. Pete Rawlinson a very happy new owner.